Hey guys! On Tuesday I did a fun little character questionnaire on my main character, Avalon. Now today I did one for the second main character of the story and Avalon's boyfriend, Tripp! These were fun little questionnaires to do that actually proved to be quite helpful! Through doing them, I learned that Avalon is a neat freak and that Tripp likes to collect things. It's pretty cool what you can learn about your characters through questions like these, so I definitely suggest you give this one a go! You can check it out here. Enjoy! Tripp Matthew Owens. Hmmm . 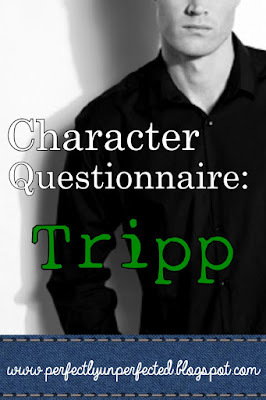 . . I’m not sure what kind of nickname could come from the name Tripp, so no, no nicknames. Tripp’s hair has actually gone through many changes as the book itself has. In the beginning drafts he had slightly long, curly dark brown hair. But now Tripp has a more blondish-brownish color and it’s a teeny bit tousle-y, but not curly. Actually, I think the only physical trait that has stayed the same for him is his dark brown eyes. Tripp has slightly sticky-outy ears, but that’s about it. Nope. Just like Avalon, Tripp’s skin is completely flawless from head to toe because of his time in Society. Tripp enjoys the company of people, but he doesn’t really know the people around him like Avalon does. While Avalon hangs out with Ashton, Sam, Emily, and Cassidy, Tripp kind of excludes himself. He definitely wishes he was closer to all of them, though. Where was your character born? Where has he lived since then? Where does he call home? Tripp was born somewhere around present-day New York, I think? I actually have no idea. But since then he’s lived in a camp near present-day Chicago, Society (present-day Cincinnati), and a the base camp near present-day Elkhart. Like Avalon, Tripp doesn’t really know what home is. Anywhere he can be alone. What is his biggest fear? Who has he told this to? Who would he never tell this to? Why? Losing Avalon. Avalon knows she’s important to him and that he loves her, but I don’t think she fully understands how much he cannot lose her. Tripp would never tell this to the antagonist of the story (who I will not describe here because reasons). Yep! While he and Avalon grow apart and she becomes closer with her brother and new friends, Tripp is sneaking around the camp trying to find proof that he and Avalon can’t trust these people. Literally anything sincerely cute or funny Avalon does. Or if Ashton makes a fool of himself. Just like Avalon, both over the course of the book. Tripp doesn’t have access to a fridge, but if he did it would be filled with sandwiches. Tripp’s floor probably has clothes and shoes scattered around, and his nightstand would be littered with trinkets and things he collected. Tripp mostly wears black boots as part of his Informant-in-training uniform. He’s not very big on finding new clothes or shoes. If he owns a pair of shoes that fit, he will wear that same pair until they’re too worn out to go any farther. When your character thinks of his childhood kitchen, what smell does she associate with it? Sauerkraut? Oatmeal cookies? Paint? Why is that smell so resonant for her? Tripp can’t remember his true childhood kitchen, but the kitchen in his life in Society probably smelled like lemon soap because his mother really liked lemon soap. Tripp is a collector, so he would probably throw away trash and that’s it. And by trash, I literally mean like food wrappers and banana peels and things. Where Avalon could get rid of everything, Tripp could get rid of next to nothing. Tripp would probably be attempting to sneak into the Lab while wondering where Avalon is and if she feels just as awful as he does. The strongest memory Tripp has is meeting Avalon when they were little kids. And the reason this memory is so powerful is something that I cannot say because it would be a big spoiler! Your character is getting ready for a night out. Where is he going? What does he wear? Who will he be with? Tripp? Going out? Pssh. Yeah, no. And that's Tripp! Hopefully you guys will be able to use these questions to learn more about your own characters.